Describe the events and reasons that led up the French Revolution in 1789. 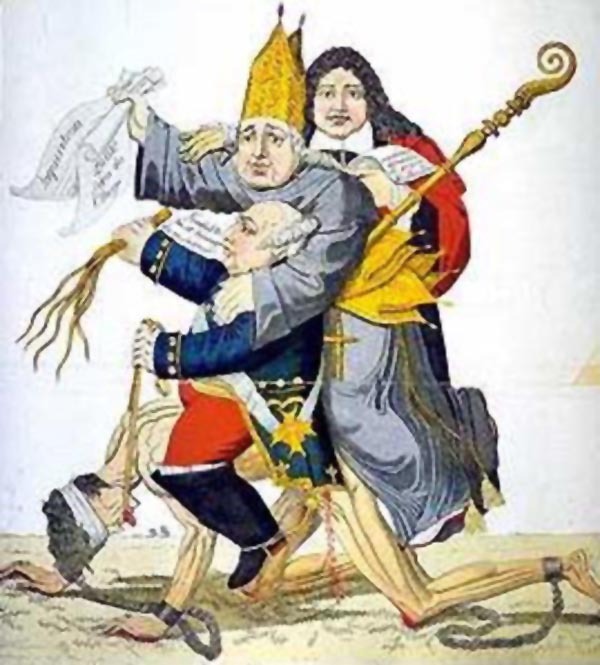 How did the National Assemblies attempts to reform the Catholic Church in France evolve to remove all spheres of Christianity or religion from France?Describe the anti-Christian sentiment provoked by groups like the Jacobins. What was the overall effect of the efforts to de-Christianize France? Before the revolution the French people were divided into 3 groups: the 1st estate consisted of the clergy, the second estate of the nobility and the third estate of the bourgeoisie, urban workers, and peasants. Legally the first two estates enjoyed many privileges, particularly exemption from most taxation. With all revolutions it starts with the masses lacking. In the case of France it was the economy, with the root problem being institutional. France did not have a proper banking and credit system coupled with a central bureaucracy with no proxies to speak for the many different peoples of the country, which included taxation without representation. Even winning wars was costly, but bad harvests and famine accelerated the collapse. Due to a lack of leadership by King Louis XVI, the nobles and even the Church to setup a reliable financial system to rescue the economy a “Third Estate” came about to fill the leadership vacuum called “the National Assembly”. It was composed of those without representation being neither noble or clergy, but had dissidents from both groups. The National Assembly sought to protect the rights of the people by reforming the government. They did not stop with the government, but also sought to reform the Church too. The Church invited this by being more focused in its own interests and welfare, including keeping the right to tax themselves, rather than the welfare of the people. The National Assembly wanted the Church to be subservient to the new state. Conflicts arose with the Church as it resisted the state, attempting to have authority over the Church. Reforms included having non-members of the Church being able to vote for bishops, and all clergy were to take an oath of obedience with half refusing to do so and thus carrying their congregations to do likewise. More and more the Church seemed to be identified by the National Assembly as one of the old powers that challenged them with the King being a devout Catholic, his brother-in-law being the Holy Roman Emperor, the lynching of a Jacobin National Assembly envoy in Rome, and rebellions in the name of the Catholic Church and king. The Jacobins subscribed strongly to French philosophies that were disparagingly skeptical of the Christian message and were the most extreme of the Revolutionaries. They associated Christianity with the dinosaurs of old power that they were replacing that needed to be exercised in order to build a bright new future sometimes the old guard need to be torn down. They recognized that people still clung to religion so they devised a replacement of a modern new religion that celebrated the new age of human reason. Unfortunately this proved much harder than thought and leaders of the Revolution were excised for straying too close to the old superstitions or became comical punch lines. One unintended consequence in trying to help the masses by getting rid of the destructive old beliefs was the lack of a support system for the unfortunate masses. The Church had a virtual monopoly on helping the poor and having been devastated by the Revolution left many without a safety net. Many felt their lot was not better with the National Assembly and longed for the olden days with the Church and a strong king figure. Discuss how an economic revolution in the 19th century gave rise to the “middle class”. Who comprised this class and what were their political agendas? Discuss how “liberalism” gained prominence through them and how it spurred the movements of “Romanticism”, “Fraternity”, and “Socialism”. What were the aims of each movement? The French Revolution was spurned on by a group of people who opposed and challenged the ancient social and economic structures that had so dominated France for many centuries. France consisted of aristocracies whose wealth and power were based mainly on land ownership and agriculture. The opposing group mainly consisted of people who were lawyers, journalists, businesspeople, urban workers – persons who would later be called the “middle-class”. This new social and economic group would play an important part in the formation of the modern world we live in today. Then in the 1830s, a radical group of politics emerged in Britain and France called “socialism”. This group believed that if society got rid of inequality or poverty, then people would naturally look out for one another as brothers. (loc. 15781) This was more or less an echo of the optimism of mankind during the Enlightenment, but without the meddlesome love ethic of Christianity. And as we know, socialism would come into a mature form with Karl Marx later on whose thoughts would have a major impact during the twentieth century. The aftermath of the French Revolution and Napoleon’s reign left a huge mark on Europe’s cultural, social, political, and spiritual landscape. Much of this was a result of the Enlightenment period’s crusade to champion human rationality over and against Christendom and the Church. As MacCulloch wrote, “The Revolution which had begun with a sincere effort to improve the Church now sought to replace it with a synthetic religion, constructed out of radical symbolism and a celebration of human reason.” (loc. 15661) All these political movements that emerged, from liberalism, romanticism, and socialism, all sought the good and progress of mankind economically and socially, but without the need for God. These secular ideals still carry on to this day and many people today are embedded within the mindset that the Church should have no part in society and that religion is an impediment to human progress and rationality. It was interesting to see the origins of these beliefs that stem back not only from the aftermaths of the Enlightenment and post-French Revolution but also with the emergence of the middle-class during the 19th century. But we must remember that much of this was the Church’s own doing with its persecution of other religions (namely Jews in the Iberian Peninsula) and constant fighting between Catholics and Protestants. The Church being so allied and close with the wealth, power, extravagance, and decadence associated with the aristocracy and monarchs did not help its cause in the long-run as well as to the common folks and intellectuals alike. But this section also showed the human need to believe in something greater than themselves. In the absence of God or a Higher power, we will find, create, uplift, deify, and worship something or someone else, be it money, liberty, progress, science, technology, rationality, humanity, etc. to guide and lead us to a perceived good. This all points to a universal spiritual thirst within us that need to be filled. The lessons and mistakes learned from both the Church and the rationalists/secularists in history should warn us of that any human institution will more than likely never create a utopian society.